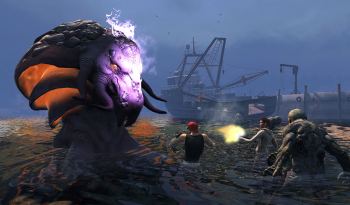 EA has Jedis and Orgres already, but now it's adding the crazy ancient histories of The Secret World to its MMO lineup. EA sure seems to like MMOs these days. The publisher's already got Warhammer Online up and running, has The Old Republic in development (working with LucasArts and BioWare, of course), and has now revealed that it's teaming up with Funcom to co-publish the upcoming The Secret World. The Secret World has been in development for a while, with Funcom teasing out information about the game over the past year. The game is set in a fictionalized version of the present-day world and will feature a "secret history" filled with magic, ancient myths, and supernatural creatures. This is probably some welcome news for Funcom, since having a partner like EA will certainly make it a lot easier to fund and develop a project as massive as The Secret World is supposed to be. For EA, this probably seems like a sound investment since Funcom has already established solid MMO brands with both Anarchy Online and Age of Conan. At the moment, there's no definite release date for the game yet.